I’ve done a tiny bit of knitting. Just enough to know that I want to try crochet instead. Ha! It wasn’t hard but I’d like to try something that will go a little faster. I don’t have big plans for this craft but mainly want something to do while watching tv in the evenings with David. I’m not a big tv person but we’ve found a few series that we both enjoy (Mad Men, Downton Abbey, Californication, Treme and True Blood). I figure if I’m watching tv I might as well accomplish a little something at the same time. I’d like to just do simple things like scarves and baby blankets to give as gifts. But it was pretty expensive so I’m going to save it until I’ve done one or two scarves and then use it to make one for myself. We will be in New Orleans next week so I plan to pick out some less expensive yarn at The Quarter Stitch for my first crochet project. Hopefully I’ll be able to figure it out from that. If not, I’ll get my daughter to show me in person. So hopefully I’ll have a completed project to show you at some point. 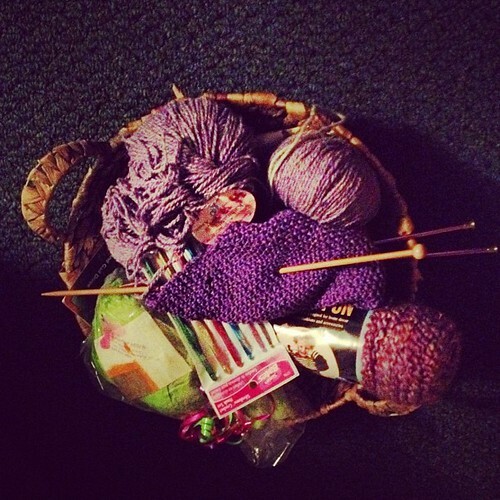 If not, I’ll at least have a basket of pretty yarn to look at. Do you knit or crochet? If so, who taught you? Any tips?